Rule number one when investing: There is no such thing as a “best investment strategy that is suited for both men and women, novice or expert.” When it comes to investments, it boils down to your risk appetite, investment horizon, age, and of course, financial goals; and all these vary from person to person. Once you have considered these points and planned your corpus, investments can be made in or from a combination of equity, debt, gold, mutual funds etc., as per the investor’s risk appetite. Ideally, saving taxes should be incidental to your investment plan. Assuming there is no inheritance or a windfall (a winning lottery ticket, maybe? ), as an investor – whether novice or expert, you first need to build a corpus. For any investment, you need an investable cache of funds. So right from the beginning, savings should take precedence over expenses (your lifestyle) as it is simpler to chalk out an investment route based on your available corpus. “Income minus Savings equals Expense” should be your mantra at all times. But even before that, it is advisable to accumulate an emergency fund, which can amount to three months of your monthly expense; this is for unforeseen situations like an unexpected layoff or the in-between-jobs phases that may arise. If your “risk profile” is more inclined towards taking risks, investing in equities could be suited for your profile as it offers quick returns, though better results are had over a more extended period. This is one reason that equities are best left to experienced punters. On the other hand, if you are a safe player averse to taking risks, investments can be made in options such as tax saving fixed deposits, gold investments like gold ETFs (exchange-traded funds), and other 'safe' investments such as Post Office Monthly Income Scheme and Public Provident Fund. However, you must bear in mind that these involve different taxation rules, which you must familiarise yourself with before investing in them. 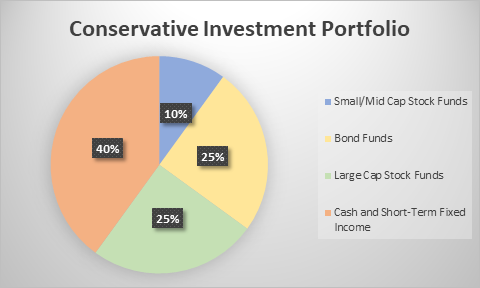 A conservative investment strategy includes putting money into low-risk securities to maintain the overall value of your portfolio. Here are some instruments that you can choose if you want to play your investment safe. Public Provident Fund (PPF): The PPF is ideal for the salaried individuals and owners of small businesses who are looking for tax deductions under 80C. Since it is operated by the government, it is largely risk-free. The minimum investment amount is Rs. 500 and the maximum is Rs 1 lakh. Additionally, PPF has one of best interest rates among fixed income products – 7.8% from October 2017 – which is tax-free. Currently, the lock-in period for withdrawal in PPF is six years, and the tenure is 15, and there is a proposal to increase both periods. National Savings Certificate (NSC): NSC is another offering from the government (via the post office). You can invest a minimum of Rs. 100 in either 5 or 10-year periods, which have interest rates of 8.5% and 8.8%, respectively. There is no maximum cap on this investment, which falls under NSC VIII Issue, and is available for deduction under 80C. The interest here is taxable, but it can be re-invested to get the 80C benefit. The lock-in period for NSC VIII papers is five years, and NSC IX is 10 years. Bank Fixed Deposits (FDs): A bank FD (term deposit) is a simple product that is ideal if your target investment period ranges between six months and two years. FDs are quite a safe investment and have a minimum investment period of 30 days. Although interest rates offered are good, they are lower in comparison to corporate deposits. Note that public sector banks usually pay a higher interest than private sector banks. It is also important to remember that early withdrawals are penalised. Sukanya Samriddhi Yojana: It is an excellent investment option for risk-averse investors. It is tailor-made for a girl child’s long-term future, particularly education and marriage. It offers a relatively high-interest rate (currently 8.3%). Investment amounts start as low as Rs 1,000 a year, and the term for this plan is a maximum of 21 years. The account matures when the girl child (the account holder) reaches the age of 21 years, but full withdrawal allowed if she gets married on attaining the minimum legal age of 18. Premature withdrawal of 50% allowed for educational purposes. You can learn more about this scheme here. National Pension System (NPS): If you are a conservative investor, one of the best long-term investment options available currently for retirement planning is NPS. Under section 80CCD(1B), you can get tax benefits for up to Rs. 50,000, and under section 80C for Rs. 1.5 lakh. PFRDA (Pension Fund Regulatory and Development Authority) regulates these investments, which is why it is considered a safe option. The minimum investment for this instrument is Rs. 500 per month. Atal Pension Yojana: An investment scheme launched by the current government, it is ideal if you have a low income, but want long-term investments. Under the scheme, the government contributes 50% of your contribution amount for five years or Rs 1,000 (whichever is lower). You are only eligible for this contribution if your income is less than the taxable amount. Additionally, you cannot withdraw until you turn 60 unless it is an exceptional case. Gold/Commodity investments: For centuries gold has been a popular choice of investment in Indian homes. It has been a proven hedge against inflation for a long time. It is a good investment option if you are a novice. However, it should only constitute a small portion (no more than 10%) of your overall assets. Investing in gold ETFs is an ideal choice as there is little chance of damages, theft or storage hassles. This type of portfolio management strategy involves high-risk investment options to maximise returns. Here, the main aim is to increase capital, rather than maintain safe investments. Equity-Linked Saving Scheme (ELSS): ELSS falls under mutual funds, and thus introduces you to the workings of equity. It offers tax-saving benefits under 80C. As ELSS funds are linked to equity markets, returns tend to vary, but the risk taken is lower than thematic or diversified equity funds. ELSS has one of the shortest lock-in periods (three years) in comparison to other 80C investments. Comes with a lock-in period of three years. Diversified Mutual Funds: The primary objective of diversified mutual funds is to create wealth. For instance, Rs. 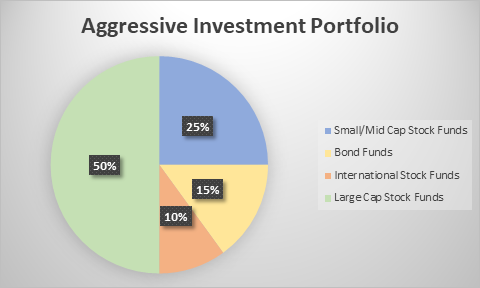 1 lakh invested in a Top 200 fund about 20 years ago, would have ballooned to approximately Rs. 23,00,000 now, which amounts to 2200% return. These funds are ideal for people who cannot regularly follow the market. They are managed by professionals. Investing in mutual funds is ideal for investing in long-term goals. Some close-ended scheme may have lock-in periods, whereas open-ended schemes can be redeemed anytime. As said earlier, the ELSS) can’t be redeemed before three years. Based on when one is redeeming the funds and the scheme, there may or may not be some taxes and exit loads. Guidance from your financial advisor is advised. Direct Equity/Stock Investments: It is a proven fact that equity or shares in quality companies are better investment options for long-term returns. It is best suited for seasoned investors or those who want to handle their own money. You can purchase company stocks directly from the market if you think they will perform well in the future. You need not be restricted to Indian stocks; you can also buy shares of foreign companies or buy international equity funds. Money Market Funds: Money market or liquid funds are ideal short-term investment options. They offer slightly higher returns than savings accounts – 5.5%-9% depending on the term and risk category. As these are invested in fixed income securities of governments and reputable companies, they are quite safe. Any surplus money available for a few months can be invested in a money market fund; the earnings would be more than if kept in a savings bank account. Investments in Commercial Papers, Commercial Bills, Treasury Bills, Certificates of Deposit and similar instruments specified by RBI come under money markets; the minimum lock-in period is 15 days. Commercial Deposits (CDs): Also known as corporate deposits, CDS make a good medium-risk, short-term investment option. The interest rates offered are slightly higher than bank FDs. And like most investments, the interest rate rises with the risk just. Typically, reputable companies tend to offer lower interest rates than smaller firms primarily because it is easier for them to raise funds. Note: You must ensure the company you are investing in does not have much debt in its balance sheet, has been around for some time, and commands good ratings (at least AA+ ratings) from credit agencies such as ICRA and CRISIL. Real Estate Investments: With India’s population ever-growing, there is a constant demand for real estate. In that sense, this is a lucrative option. But it is also an easy investment route that can include counterfeit documents and false promises. On the one hand, real estate tends to appreciate in value and can be acquired with affordable home loans. On the other, self-occupied homes are not exactly an investment. They do not bring returns unless sold; in that case, it becomes an illiquid option. In times of emergencies, real estate may have to be sold at a discount price. Additionally, buying real estate is a tortuous process, while prices are sometimes unnecessarily increased. Often, black money is involved in this process. Based on your risk appetite, your financial goals and current standings, you can consider putting together different investments for your portfolio. Knowing which meets your needs perfectly, can help you create a strategy that wins for you.